Selfridges ‘Destination Christmas’ press launch event. 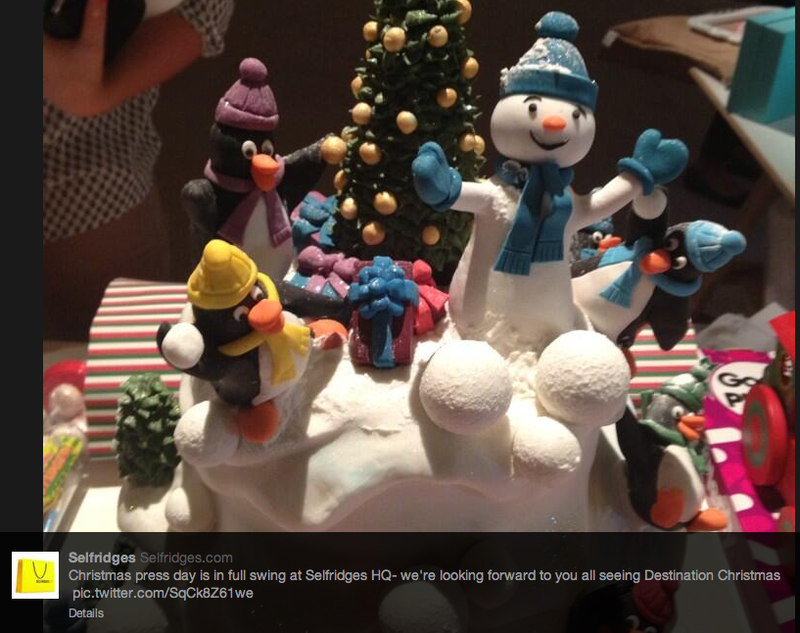 The picture above is from a teaser tweet they sent out – the text reads “Christmas press day is in full swing at Selfridges HQ – we’re looking forward to you all seeing Destination Christmas.” It’s interesting to see that they are using their ‘Destination’ branding for Christmas which really makes perfect sense for them and fits nicely with their other campaigns. We haven’t had it confirmed yet but as in previous years we’d expect them to have their Christmas department open for the last weekend in July / start of August. As soon as we hear more we’ll bring you more news. Now as regular readers will know I really do not approve of shops selling Christmas goods before November, but it does make some sense in London. These are not your normal city centre stores, much of their trade comes from people who are visiting London and who want to pick up something to give as a special gift at Christmas. If you’ve visited either of these stores what did you think of them? What did you buy? I’d love to hear from you and know what you thought of them. A number of retailers are increasingly confident of having good sales this Christmas and will be avoiding the temptation to start sales before Christmas and won’t be discounting products this year. Today Selfridges revealed soaring sales in their Christmas and toy departments. They said sales in their Panto themed Christmas shop, which opened on August 8, have jumped 52% year-on-year, with the average transaction value rising 33%. Mean while John Lewis managing director Andy Street has forecast that there will be less high street discounting during the crucial festive period. They expect that retailers will have carefully balanced their stock with the likely demand and therefore there won’t be surplus stock to be cleared through discounting. It seems most likely that any sales or discounting will wait until Christmas Day online and Boxing Day in stores so that customers can take full advantage of the lower prices before VAT goes back up to 17.5% in the New Year. The advice is to workout what gifts you need to buy and then buy them early or during October rather than leave it until the last minute expecting to pick up bargins. The chances are that with retails playing it safe after the recession popular gifts will sell out before Christmas, rather than them being left with stock for the New Year sales. At the time of writing in early August there are over 130 days until Christmas yet I woke to a news story on the radio about Selfridges openning their Christmas department early this year. According to the BBC Website A spokeswoman for Selfridges said: “It gets earlier and earlier every year. This year there are a lot of tourists in London because of the situation with sterling.” and apparently Christmas departments open in their Manchester and Birmingham branches open in October. I remember when we wouldn’t start to think about Christmas until after Bonfire Night or at least Halloween. Do you think starting the Christmas season in August is a good or bad thing?